Eleven years ago I lost my mom to the Big C, at the time I felt like the only one. I knew that cancer was pretty rampant, but I had no idea how many people it affected. A few years later I heard about an event going on in our city, so I thought I’d stop by with my girls. Relay for Life was in its inaugural year in Blackfoot and how much fun it was. I really didn’t understand what was going on, but it was fun. For those of you that have not been to a Relay for Life, let me give you the basics, because everyone should know what’s happening when you get there. The most important thing to remember is that you are always welcome there! 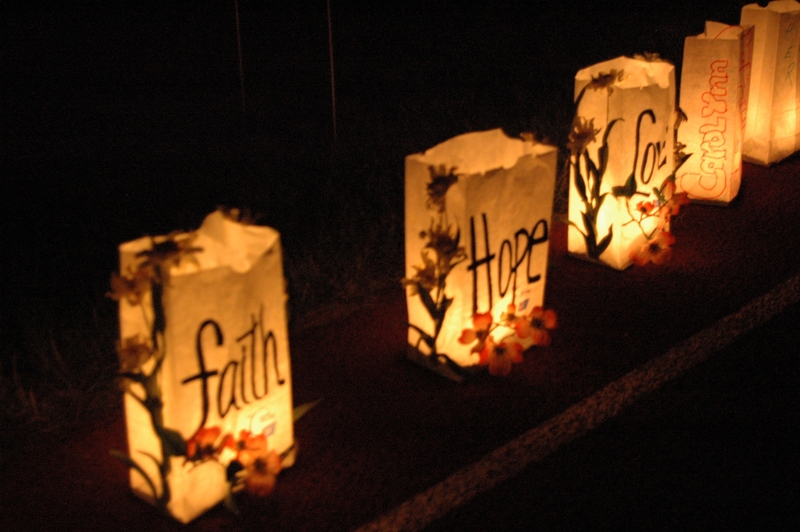 Relay for Life (RFL) is a celebration, it is the culmination of a lot of hard work by an entire community. Sure there are some people who worked harder than others, but it really is about the whole community. Over the course of the year before, countless hours will have been spent on preparing for the event itself, but more importantly, countless hours have been spent by individuals raising money for the American Cancer Society. There will have been parades and Texas Hold ‘Em tournaments; Bids for Bachelors and Bunko parties; bake sales and yard sales; raffles and dances; penny brigades and talent shows; dinners and luncheons. All for the same cause, to raise money to someday beat cancer. I love the “Relay season” The time of year when all these events are going on, it usually starts in January with the RFL kickoff and proceeds right up through the event. Some of our most successful fundraising came at the event itself. The night of the event is designed to Celebrate – to celebrate all the accomplishments of those who put so much effort in to fundraising, to celebrate the lives of those who have battled cancer and won, to celebrate a community coming together for a great cause. The night is designed to Remember – to remember those we have lost to cancer, to remember why we raise money to battle the Big C, to remember to care about one another now, while it matters. The night is designed to Fight Back – to fight back against a common enemy, to fight back against naivete in our own battle against the disease, to fight back with all the resources we can muster, including money. RFL is an event that happens in over 4000 places around the globe: in elementary schools, on college campuses, in communities such as ours. The event itself was begun by Dr. Gordy Klatt over 25 years ago in Tacoma, Washington, it has evolved some, but is always celebrated with some common elements. There is a Survivor Lap at the beginning of the ceremony to celebrate those that have fought and won and those that are currently in treatment. An opportunity for them and others to see they aren’t alone in their struggle. There is a Luminaria ceremony not long after the sun goes down, this is the remember part. It is a quiet, reverent affair, a time to reflect what we have lost. Our local event generally has bagpipes and a ceremony that expresses our common wish that our HOPE turns to a CURE. I love Relay, I have been active since that first event, I’ve gone to other Relays where I don’t know anyone because I always come away feeling good. Seeing that in this world many people are working for a common goal. But, of course, there have been numerous people who have made my Relay experience great and I want to thank them. My daughters for always coming and helping, no matter the year and what else is going on in their lives. They Relay for Grandma; my old friends, Sara and Vicki, Carrie and Dawn D. for being a part of Relay on mostly a team level, although Sara went on to chair the event. My new friends, Dawn L. and Kathy, Susan and Joyce, Andrea and Tina, Jody and Jordan, who have worked tirelessly to make their local event a success. Any past team members, including those on the Idaho Falls EIRMC/CRC team and those on the First American team or the Earth Angels team, for all of the efforts they have made. My donors, Greg, Dwain, Tom, Jerry, Bill, Joe, Sandy and Diane – who donate lots, and all those who donated small amounts too – the dollars add up, thanks for putting me in the Grand Club three years in a row. To all of those I have met and cried with who have fought and won, and to those who remember a loved one with me, thank you for sharing your stories, for touching my heart, it is for that that I am most grateful. This entry was posted in Uncategorized and tagged Relay for Life by Vagabond63. Bookmark the permalink.